John Darnielle at Maximum Ames Music Festival. “This may go on a minute…” John Darnielle. At the first 80/35 in 2008, The Flaming Lips’ Wayne Coyne expressed a desire to return in the festival’s fifth year. Obviously it didn’t happen, but The Maximum Ames Music Festival managed to pull off something similar in its fifth year, getting The Mountain Goats to make a return visit following his headlong the inaugural fest in 2011. Saturday night’s concert was an entirely different experience than John Darnielle’s 2011 concert (though both were solo versions of the Goats). 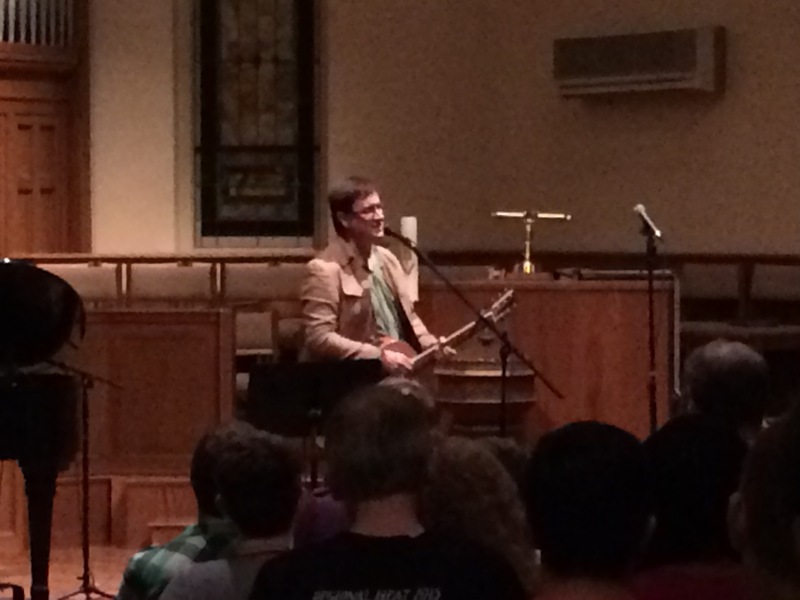 In the first year, Darnielle was performing at DG’s Tap House, a space that provides great energy for concerts, while 2015’s show was at First United Methodist Church. The experience at the latter is somewhere between a theater and a listening room show. There were no loud bar conversations or general milling about this time around. The crowd sat in rapt attention during Darnielle’s set, with the singer-songwriter reflecting on how his quieter songs work well in churches, but his louder songs, where at times it feels like he’s shouting at the audience, work better in bars where he feels “in the same yelling and screaming vortex” with the crowd. Darnielle entered the stages sitting at a grand piano and starting the show with “This Is My Father’s World,” a Christian hymn that felt fitting for the setting. From there he moved to the acoustic guitar and related that he had visited his former home in nearby Colo earlier in the day. There he had discovered the house had been torn down for being a fir hazard. He shared that he had written “There Will Be No Divorce” there before playing the song. It was cool the find out Iowa’s connection to the song, one of several Iowa origin stories he trotted out over the course of the night. Iowa and wrestling were the themes of the night. The latter largely due to the wrestling-themed 2015 album “Beat The Champ.” But, of course, Darnielle’s songs are never as simple at they might appear on first listen. Before “Animal Mask” he related his distaste for songs about fatherhood, and the conflicts that created when he became a father. In the same lead-in he defined the concept of a Battle Royale in wrestling. Darnielle went from that loud song to a near whisper on the next, “Wild Sage.” On some of the quieter songs, the crowd seemed to almost hold its breath to avoid missing out on a word. Darnielle closed out the main set with what I believe was a version of “Song of The Three Children,” saying it was his first time performing it outside his house. He also mentioned that he had missed his calling as a youth minister. I love that Maximum Ames has given me two entirely different opportunities to see one of my favorite artists. The festival isn’t as big and ambitious as its older sibling, Mission Creek in Iowa City, but every year it brings a variety of familiar faces, new acts and unbelievable gets to downtown Ames. I hope Max Ames brings John back for year 10 as well.